February is here, which means it’s almost time to welcome one of our favorite holidays of the year – Valentine’s Day! Valentine’s Day is all about celebrating love. With love songs on the radio and shades of red and pink heart shaped decorations taking over retail stores and cafés, you can’t help but feel the romance in the air. Another reason why we love Valentine’s Day is that it is the perfect occasion for dressing up. Whether you’ve got a fun lunch date planned with your significant other or planning on spending this year’s day of love with your girls, you’ve got to celebrate it in style! Here are some of our favorite romantic yet easy Valentine’s Day hairstyling ideas, to help you switch things up this year. This hairstyle adds a little romantic twist to the conventional bun. Start by brushing your hair backwards with a rat-tail comb. Next, use the tail of the comb to split the hair in the middle and then form two ponytails. Secure the ponytails with elastics and then twist them to form the shape of a heart. Use hairspray and bobby pins for additional stability. This unique hairstyle is surprisingly one of the simplest ones to replicate. Take small sections of hair from left and right side and use them to form a ponytail. With your elastic, go over your hair once and form a ‘loop’ the second time around. Split this loop into two sections with your thumbs to form a bow. Readjust the sections to make them look even and secure the bow in place with bobby pins once you’re satisfied with the overall look. Apply hairspray once you’re done to ensure that the bow doesn’t unravel throughout the day. 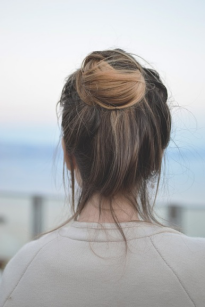 If you’ve got textured and gritty hair that’s difficult to manage this romantic low maintenance messy bun should be your go-to hairstyle on Valentine’s Day! Begin by teasing your hair at the crown. Next gather your hair at the nape of your neck to form a low ponytail and secure it loosely with a hair tie. Once your ponytail is in place, split it into two sections and twist them onto each other to form a rope braid. Wrap this braid in the form of a bun and secure the ends with bobby pins. Tug on sections of hair at the crown to add extra volume. Lock your hairstyle in place with the help of some flexible-hold hair spray. You can never go wrong with a bouncy blow-out. For this one, you’ll need freshly washed, damp hair. Start off by applying heat protection spray. Next, pull your hair upward to dry the roots of your hair. Once you’re done, use a large barrel round brush to create a bouncy and voluminous look. When blow drying, keep your drier at least 10-12 cm away from your hair to minimize heat damage and switch angles of the brush every now and then. Spray some hairspray in the end and you’re all set! Looking for a high end hair salon in Houston to help you look your best this Valentine’s Day? Get in touch with us! Hair Extensions of Houston is a luxury full-service hair salon based in Houston, TX. We provide comprehensive hair extension installation and maintenance services, along with a wide range of hair care services. Whether you’re looking for natural looking hair extensions or a thinking of switching up the color of your existing set, our experienced hair and highly skilled team of stylist can cater to all your hair care and styling needs. Book an appointment today by contacting our representatives at 832-717-3626!